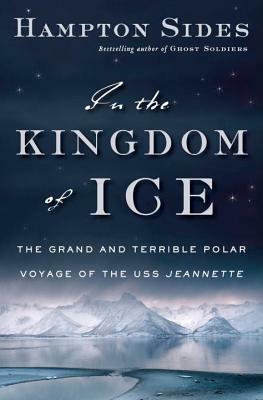 In the Kingdom of Ice: The Grand and Terrible Polar Voyage of the USS Jeannette (Hardcover) | The working bookstore for the reading class. James Gordon Bennett, the eccentric and stupendously wealthy owner of The New York Herald, had recently captured the world's attention by dispatching Stanley to Africa to find Dr. Livingstone. Now he was keen to re-create that sensation on an even more epic scale. So he funded an official U.S. naval expedition to reach the Pole, choosing as its captain a young officer named George Washington De Long, who had gained fame for a rescue operation off the coast of Greenland. De Long led a team of 32 men deep into uncharted Arctic waters, carrying the aspirations of a young country burning to become a world power. On July 8, 1879, the USS Jeannette set sail from San Francisco to cheering crowds in the grip of "Arctic Fever." The ship sailed into uncharted seas, but soon was trapped in pack ice. Two years into the harrowing voyage, the hull was breached. Amid the rush of water and the shrieks of breaking wooden boards, the crew abandoned the ship. Less than an hour later, the Jeannette sank to the bottom,and the men found themselves marooned a thousand miles north of Siberia with only the barest supplies. Thus began their long march across the endless ice—a frozen hell in the most lonesome corner of the world. Facing everything from snow blindness and polar bears to ferocious storms and frosty labyrinths, the expedition battled madness and starvation as they desperately strove for survival. HAMPTON SIDES is an award-winning editor of Outside and the author of the bestselling histories Hellhound on his Trail, Blood and Thunder and Ghost Soldiers. "Enthralling… In the Kingdom of Ice is a brilliant explosion of narrative non-fiction: detailed, moving, harrowing, as gripping as any well-paced thriller but a lot more interesting because it is also true… Too often American heroism is presented at one-dimensional success against the odds… This is a much more subtle and rewarding book, an account of magnificent disaster, of courage devoted to attempting something that could not be done." "Compelling....Sides spins a propulsive narrative from obscure documents, journals and his own firsthand visits to the Arctic regions visited by the Jeannette and its crew. In the Kingdom of Ice makes for harrowing reading as it recounts the grim aspects of the explorers' battle for survival: illness, crippling frostbite, snow-blindness and the prospect of starvation. As grisly as the details are, you keep turning pages to find out how DeLong and his men pull themselves past each setback — even though there's always another one looming ahead." “First-rate polar history and adventure narrative...wonderfully evocative.... Sides vividly recounts the horrors [of the voyage]. In the Kingdom of Ice is a harrowing story, well told. "Hampton Sides conjures the doomed USS Jeannette and her courageous crew with haunting power...."
"Hampton Sides is one of America’s most expansive and engaging storytellers, and he proves it again with the incredible saga of the USS Jeannette...."
"A vivid tale of exploration set in a howling, deadly wilderness."